The stories behind some of India’s vintage and classic cars are as unique as the cars themselves, if not better. Do you know about Marespand Dadachanji’s 1948 Morris 8? It’s an important member of this Parsi car restorer’s family. Now when your job takes your family places, you don’t leave your close, elderly relatives behind, right? When the Dadachanjis had to shift to Colombo from Nagpur during the early 1980s, as Dadachanji Senior had to take over priestly duties at a fire temple, they drove it all the way there – including taking it on the ferry to Sri Lanka from Tamil Nadu. When the family had to return to Nagpur, well, what do you know, the elderly Morris Dadachanji was driven back the same way. The little Morris was so integral to this Parsi family that they didn’t have a modern car as late as the 1990s to get around. Indeed, it’s still a hardy runner. So I was not surprised to see it recently at Jaipur. Marespand had driven it down from Mumbai for the Cartier event and drove it back home as well – along with a bunch of other classic cars from Mumbai. 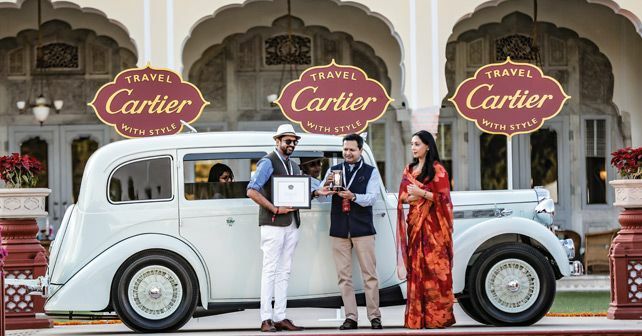 The heritage car event that I’m talking about – the Cartier ‘Travel With Style’ Concours d’Elegance, to give it its full name – was held last month at Jaipur. The Morris may not have been an official entry at the event, but even a humble car like it had a story or two to tell. Rarity apart, in vintage and classic car circles, a vehicle with provenance is given a lot of weightage – in the case of mass-produced classics, even more so. To provide you an example, if there are two virtually identical 1959 Chevrolet Impalas in similar condition and with equal miles under the hood, the one that has impeccable provenance has more value. For instance, if a celebrity owned one of these Impalas, or if it made an appearance in a movie or was used to ferry a dignitary, it would be considered more valuable than the other one. Car collectors in developed countries pay a premium for provenance. Well, that may be rather obvious in a Western context, but many in the worldwide classic car circles acknowledge that the stories behind some cars that are unique to the Indian subcontinent are, well, unique. Morris Dadachanji could easily qualify to be one of those. The oldest Benz in India – a 1914 8/20 HP Runabout – is another. Bought new from Benz & Cie, Mannheim, by Rao Bahadur PC Muthu Chettiar, it has been with the same Madurai family ever since. While this Benz runabout was presented at the previous Cartier event in Hyderabad, one of this year’s winners – Shrivardhan Kanoria’s painstakingly restored 1906 Renault 8HP Runabout – has also been part of the family for decades. Same with Vidisha Asarpota and Daman Thakore’s 1950 MG YT Tourer, acquired in the 1970s. To us Indians, it may not be surprising to hear that a car has been with the same family for decades, but it does impress our visitors. Longevity of ownership and celebrity status apart, cars that were custom-built as per a user’s requirements – especially reflecting Indian driving or social conditions – get attention. For example, one of the cars at the Cartier show was Ravi Pittie’s 1937 Daimler 24EL limousine painted white. In the first place, it was a ‘purdah’ car, which itself is distinctive to the Indian subcontinent. The other thing was that it is painted white inside out – the engine block, the chassis and the steering wheel too! It was used by a member of Kolhapur royalty who was a widow, hence the all-white specification. Amal Tanna’s prize-winning 1919 Packard Twin Six Limousine – which looks like a plush, well-upholstered period drawing room on wheels – also reflects India’s rich past. While the Twin Six itself is a historically significant model owing to the jewel of a 12-cylinder engine that built the fortunes of the American marque, the car was sold by a 21-year old French lady automotive dealer to the Governor General of Pondicherry. Imagine all the elements that make up this car’s provenance! We don’t necessarily need international specialists to endorse how special our cars are because of our unique history and social conditions, but we do need that global recognition and appreciation. Like our historical monuments, our heritage cars also tell stories. We need more-and-more people to listen in, especially future generations – this will aid in their preservation.